Persea Books, distributed by WW Norton. May 2016. 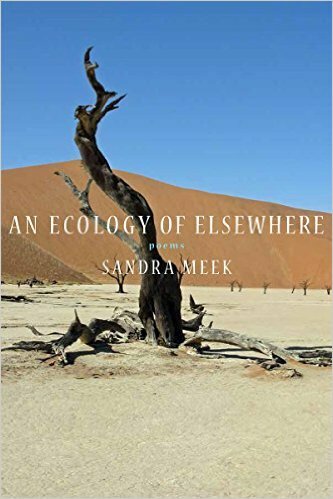 ​Following her mother’s death, nearly twenty years after her time as a Peace Corps volunteer in Botswana, Sandra Meek, a writer of “dazzling, intimate poems” (Library Journal), began traveling frequently through southern Africa. During this same period, she and her sister traveled the American Southwest with their declining father, confronting and healing from a difficult family history before his death. 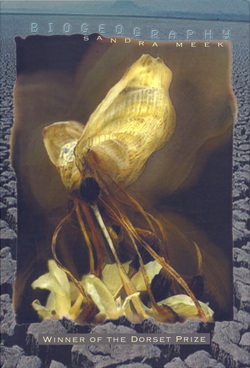 Whether describing a Namibian baby seal hunt, 1500-year-old Welwitschia plants living off of fog in a desert studded with landmines, or the sandstone “temples” of Zion National Park, Meek’s poems attend to the endangered as well as the enduring, braiding personal narratives with those of the natural world from which they arise. At once nomadic and deeply rooted to place, An Ecology of Elsewhere interweaves a difficult past, personal and terrestrial, with an uncertain future. Persea Bks, distributed by WW Norton. 2012.
about both the personal and the political . . . ."
Sandra Meek’s breathtaking new collection exhibits the extraordinary scope and power of her work. Whether these meditations consider the ravages of illness—or those of the natural world—she holds us close to the intimacy of loss. Yet these poems remain fearless in their belief in human reckoning, and the orchestrations of these lines match the power of the poet’s mind at work. Elegant and elegiac, the poems of Road Scatter gather into a book of the body, a book whose ending we know awaits each of us not far up the road, in the distance quietly closing in ahead. "Sandra Meek's Biogeography is written with urgency and verve in every line. 'I know my body will become/its own fist of blown glass, you the sweep/of light my camera first//caught of the stars,' she writes, and we are haunted by the snaking turns of past and present, the 'blindness always there//at the heart of flowering.'" "By the map of a turtle's neck, the staircase of a voice, the music of a small dog's nails, Sandra Meek reads the world anew, reminding us of its endlessly dynamic and divine substance. The immersion of the self, the selfhood of all living things, into the history of the landscape is the creative act that Meek performs here, an act often accompanied by the hard cold fact of human atrocity . . . . That these poems assume metaphor rather than fret to develop it gives them a deeply evolved quality--Meek achieves in two lines what a poem of old might need thirty for, and she does so with an effortlessness that smacks of magic." with us, including ourselves. Meek touches the awful disappearance of life and its vital howling against absence. This is a remarkably tender and beautifully wise book, without blame, without sentimentalism." 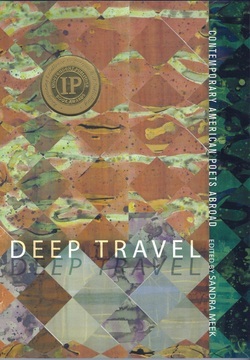 Edited and with an introduction by Sandra Meek, Deep Travel: Contemporary American Poets Abroad brings together the work of thirty-four contemporary American poets whose art and whose lives have been significantly enriched by distant journeys. Covering landscapes ranging widely, from Antarctica to Zagreb, from Italy to India to Iraq, these intelligent and intensely felt poems generously weave the reader into the lush diversity of word and world. Each poet is represented by three poems and a prose piece by the poet about the significance of international travel in his or her work and life. 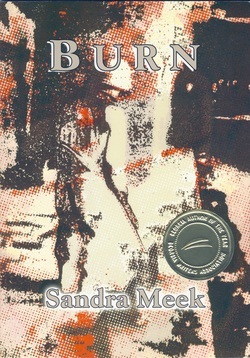 "Sandra Meek's Burn is crafted with stealthily reflective care in an effort to restrain the hysteria towards which the new century seems to hurtle with 'democracy in entropy' as the ' . . . bisected self goes on . . . trampling rusted machetes in the grass.' The cosmos thus far endures, our best, our only reassurance. Whether or not we can get ourselves back to the garden, we are all stardust, and we might want to foget, once and forever, about building that fallout shelter." "These poems are, in a broad sense, poems of homage. There's a kind of playful dialectic evident here, a mind trying to embrace everything that draws it in and being changed in the process, a synthesis of observer and observed. The reason of the poems, an almost scientific desire to be specific, to get it right, ultimately turns to metaphor, to the need to make categorical and logical jumps in the pursuit of understanding. Light runs throughout this book--the light of stars, the light of the mind . . . . While redemption is not the intention of these poems, it is suggested by the confidence and beauty with which they proceed. What becomes clear reading the work of Sandra Meek is that intelligence, deftly applied, is love." "The landscape of Botswana, and its otherness to human understanding, is palpable in these poems . . . . The book explores and enacts (not least in its estrangements of language) the otherness of the physical and social worlds, and the ways in which they other the speaker. She neither romanticizes nor patronizes those conventionally defined 'others' who are her students, her colleagues, her friends, but instead recognizes and explores the ways in which she herself is other, not just to those around her, but to herself. Crossing borders of place and self, 'erasing/the margin of regret,' while redrawing it, Sandra Meek tells us 'The history//of the darkness of light,' making the vanishing visible." 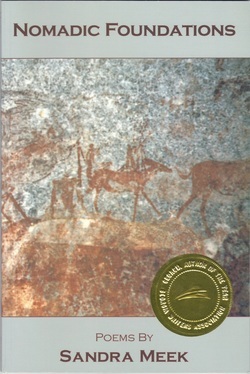 "Sandra Meek's book is dedicated to the secondary school students she taught in Botswana in 1990-1. It explores both sides of the Great Divide between the native culture and the one superficially imposed on it by the developed world . . . . Meek is even-handed. She neither judges nor praises, but the reader comes away from these often stunning poems with a broken heart." 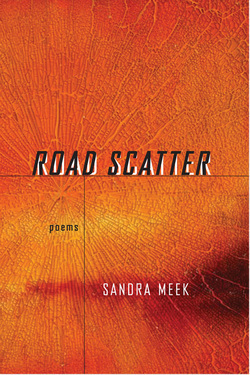 "With her passionate syntax, Sandra Meek excavates experience while at the same time clinging lovingly to its surface contours. 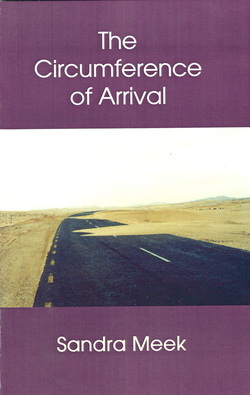 The Circumference of Arrival is a perfect description of her fascinating, and paradoxical art." "This is a brilliant book by a brilliant young poet, and yet what shines forth is as often the simple terrifying evidence of history as it is (and it is) the complicated consolations of her art. No poetry being published today is more intelligently aware of time and place and mortality, and yet able to attain moments of grace and elegance. Sandra Meek has done that necessary, difficult thing of which poetry is capable: she has taken the world in all its horror into her confidence, and yet she still rejoices in the beautiful and the tender. When she considers the grave of Cecil Rhodes, she admits that yes, the sky has fallen . . . 'to blue splinters; spilled like tongues / lizards swarm Rhodes' grave, / knocking the brass door / to his body, the space left behind.'"